Transfer Flow – Drive farther with an extended capacity fuel tank. 56 gallon tank for Long Bed/ Quad Ca hangs ½ inch below lowest part of frame rail. The fuel tanks are manufactured from 12 and 14-gauge aluminized steel for superior rust resistance and strength, and are baffled for extra support. They come with all components needed for installation, including straps and mounting hardware, and are powder coated black for a durable finish. The HD Series of the FASS fuel System provides many benefits to the consumer besides high mileage fuel pumps and superb filtration. This series goes beyond removing debris and water, the HD Series removes air/vapor from the fuel. This not only robs vital engine performance but can cause severe damage to fuel injectors. Give us a call at 714-848-2170 M-F from 8-5 PST – We will answer your questions regarding the FASS fuel System. Ask about Free Shipping! Live locally? Feel free to stop by our location and meet us! 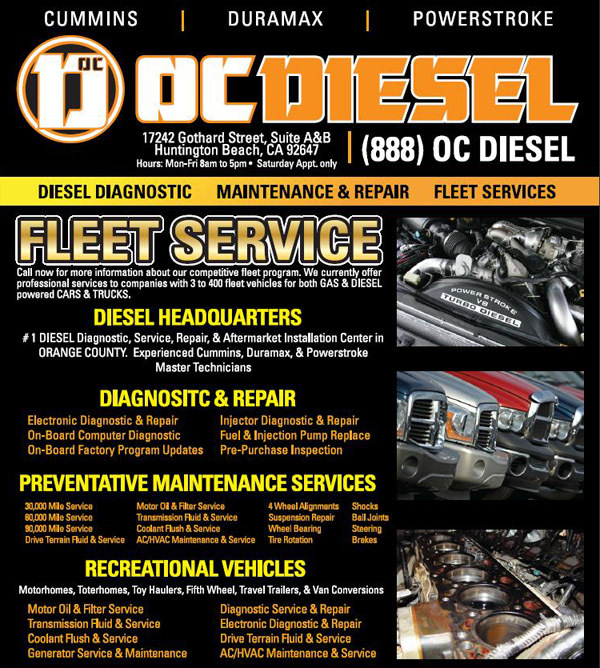 OC DIESEL, INC. is located at 17242 Gothard Street, Huntington Beach, CA 92647 Suites A and B. In addition to carrying FASS fuel System, we have a full service shop staffed with knowledgeable technicians who are ready to squash any Diesel Repair issues.